NorCal MINIS | Northern California's Premier MINI Cooper Club: "New Cooper S Exceeds Expectations"
"New Cooper S Exceeds Expectations"
It creates a motorway menace that's small and nimble with enough "naughty" potential to indicate that the JCW version will be an angry wee animal. What Did The MINI Say To The Car Behind It? A Used Car "That Can Go The Distance"
Does Your MINI Wink At You? 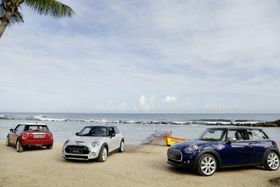 MINI Drop Tops Considered "Best Bargains"
Both Are Owned By BMW, But Really . . .
Are MINI Diesels Actually Coming To The U.S.?